WOW Freedom Menstrual Cup is so soft, flexible, comfortable and bell-shaped cup made Now its time to transform your menstrual habits with this amazing WOW Freedom Cup! It is commonly used for 12 hour cycles twice a day, However, it can be used and emptied more frequently in case of heavier flow. Product description: WOW Freedom Menstrual Cup is so soft, flexible, comfortable and bell-shaped cup made Now its time to transform your menstrual habits with this amazing WOW Freedom Cup! It is commonly used for 12 hour cycles twice a day, However, it can be used and emptied more frequently in case of heavier flow. 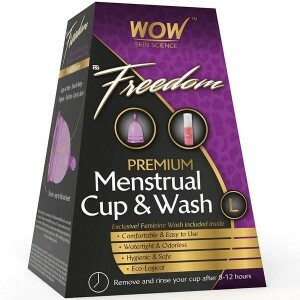 Benefits:WOW Freedom Cup is completely safe to use overnight and it is also suggested to be used first in the morning and then just before going to bed, although it can be adjusted as per your needs. This product is 100% safe to use and help to keep you hygienic all time during periods."